The Civil War, the nation’s most important event, is the subject of seemingly endless fascination. This majestic compilation of objects from the era reminds us why. The task of choosing 50 objects was a difficult one, given the enormous amount of artifacts the Society has from the time period. 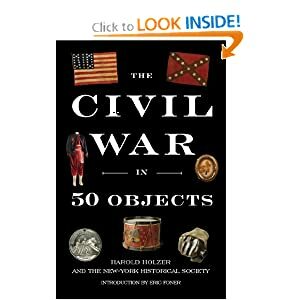 In The Civil War in 50 Objects, distinguished Civil War scholar Harold Holzer strikes a fine balance between political, social, cultural, military, and economic history, discussing a wide range of paintings, letters, weapons, photographs, woodcuts, uniforms, drums, diaries, petitions, drawings, and documents. There is something here for any student of the Civil War. And by distilling the conflict to a manageable number of objects, described in chronological order, Holzer gives the era a sense of clarity, allowing one to walk through the conflict’s key events and themes. Holzer is most passionate in his discussion of objects relating to race, his writing most majestic when writing about slaves. “The arc of black freedom constitutes the most important thread running through this book,” a collection of “items that dramatize and illuminate in altogether new ways America’s convulsive struggle to redefine itself and, in the end, to make good, after more than four score years, on the original promise of the Declaration of Independence that all men are created equal” (xxiv–xxv). Race bookends the text, as it begins with shackles for a slave child -- an object guaranteed to send a jolt up your spine -- and ends with the Thirteenth Amendment. Holzer offers a fascinating take of Lincoln’s canny discussion of colonization in the period after announcing the Emancipation Proclamation, a majestic chapter on the Proclamation itself, and an attack in a following chapter on “the unsustainable argument that the Emancipation Proclamation freed no actual slaves” (189). "The document actually 'freed' as many as 500,000 slaves before war’s end. That is, enslaved African Americans like those forced to labor at Jefferson Davis’s plantation rushed into army camps at the first sign of Union troops. The proclamation’s effectiveness as a freedom document has been vastly underestimated. But then, so has the determination and courage of the slaves who based their risky escapes on its promise of legal freedom" (194). Critics of the film Lincoln will appreciate the emphasis Holzer gives to the essential role blacks themselves played in ending slavery. Another theme throughout the text is the crucial and fascinating role New York played in the war. Holzer reminds us that in the period between Lincoln’s election and inauguration “few realized at the time how deeply interconnected the city’s economy had become with the institution of slavery and the export of cotton” (44), and how deeply unpopular Lincoln was in the city. The vote in 1860 were more than two to one against him. New York, under its openly pro-Confederate mayor, even toyed with secession and becoming an independent republic. Lincoln visited New York on way to his first inauguration -- and “would never appear in public in New York again” (51). In 1864, New York City voted strongly against Lincoln. Holzer ends nearly each of the brief 50 chapters with a wonderful story, nugget, or turn of phrase. Among them: a slave that returns to a plantation and, during a brawl, killed his wife’s excessively cruel former master; an artist whose work during the war changed from stereotypical views of blacks towards a sympathetic portrayal of their plight is described as “in the space of just three years … also liberated” (15); the tale of a New Yorker who fought for the Confederacy and died in action -- on April 14, 1865; a painting that was reassembled in time for the New-York Historical Society recent reopening after extensive renovations -- on November 11, 2011, Veteran’s Day; the Georgian who stated that “If slaves will make good soldiers, our whole theory of slavery is wrong,” prompting Holzer to write: “By war’s end, the 200,000 or so African American men in arms proved [his] point” (158); though northern newspaper accounts after the Battle of Gettysburg were full of optimism, “In fact, the war was only halfway over” (188); Holzer’s outrage that “none of the rioters who plundered and torched the Colored Orphan Asylum” during the 1863 New York Draft Riots “was ever brought to justice” (214); an amusing list of predictions from the 1864 Metropolitan Fair of New York about life in the city in 1964 that would actually come true. When Lee at his surrender met Grant’s military secretary, Ely S. Parker, a Seneca Indian, Lee reportedly paused, and then said “I am glad to see one real American here,” to which Parker responded, “We are all Americans” (315). There are other light moments. We learn why Mary Todd Lincoln was so enamored by a family portrait: “The heavily retouched [Mathew] Brady image had miraculously carved inches from her ample posterior” (107). One person signed a petition to Lincoln as “John Brown of Harper’s Ferry” (157). When Grant checked into a Washington hotel in 1864 with his son, the clerk did not recognize the poorly-clad officer and initially gave him a small room on the top floor. There is a terrific section on George Templeton Strong’s diary. Strong wrote in his diary nearly every day for the last 40 years of his life -- over four million words -- in beautiful penmanship and “characters so tiny and densely packed that each page looks more like the Rosetta stone than a Victoria-era personal journal.” (260). When Strong died in 1875, his New York Times obituary, unaware of his diary, stated that “Although not the author of any literary works, he contributed many articles of rare merit and essays of elaborate research” (264). Strong’s vivid impressions of Lincoln, whom he personally saw several times and met in person in Edward Stanton’s office in 1864, are priceless. The book contains a useful eight page bibliography and an eloquent introduction by Eric Foner. “Emancipation liquidated the largest concentration of property in the United States,” Foner explains. “In 1860, the economic value of slaves as property exceeded the combined value of all the nation’s railroads, banks, and factories” (xxxi). Though a few objects might only capture the attention of specialists -- a ship model; buttons; a footlocker -- the book should be of great interest to scholars and generalists alike, and especially attractive to American history teachers, as the beautifully reproduced images could be used in any number of creative ways in the classroom, to almost any age group. Above all, Holzer has the mark of a great teacher: he makes the reader feel as if they were there. A cast of Lincoln’s right hand is “the oversized hand that would one day sign the Emancipation Proclamation and grasp the text of both the Gettysburg Address and the second inaugural” (37). We see a sheet of paper in Lincoln’s own hand, written in early October, 1864, calculating his prediction for the upcoming election. On the left is written “Genl. Mclellan,” on the right “Abraham Lincoln,” and underneath each are listed the states and their Electoral College votes. (It’s awfully close, Lincoln concluded.) Chapters on a letter concerning Lincoln’s assassination and on the weeks following his death are especially enthralling. Holzer even makes uniforms and snare drums interesting. For this reader, it was a shame to have the book end. If you can’t make it to the New-York Historical Society in person, this is perhaps the next best thing. See for yourself.